The variety and pervasiveness of confidentiality issues today is breathtaking. Not a day passes without a media report on a breach of confidentiality, a claim of attorney-client privilege, a journalist jailed for refusing to reveal a source, a medical or hospital record improperly disclosed, or a major business deal exposed by anonymous sources. In Confidence examines confidential issues that arise in various disciplines and relationships and considers which should be protected and which should not. 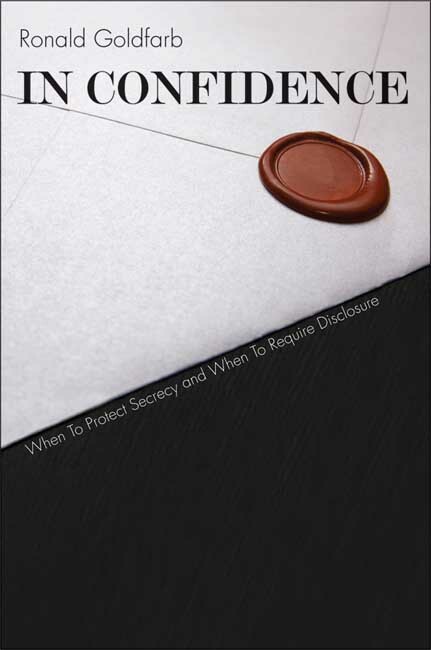 Ronald Goldfarb organizes the book around professionals for whom confidentiality is an issue of weighty importance: government officials, attorneys, medical personnel, psychotherapists, clergy, business people, and journalists. In a chapter devoted to each, and in another on spousal privilege, he lays out specific issues and the law’s positions on them. He discusses an array of court cases in which confidentiality issues played an important role and decisions were often surprising and controversial. Goldfarb also looks into the criteria that should be used when determining whether secrets must be revealed. His nuanced analysis reveals how federal government practices and technological capabilities increasingly challenge the boundaries of privacy, and his thoughtful insights open the door to meaningful new debate. Ronald Goldfarb is an attorney and author of ten previous books as well as hundreds of law journal and newspaper articles, op-ed pieces, and book reviews. He lives and works in Alexandria, VA and Key Biscayne, FL.